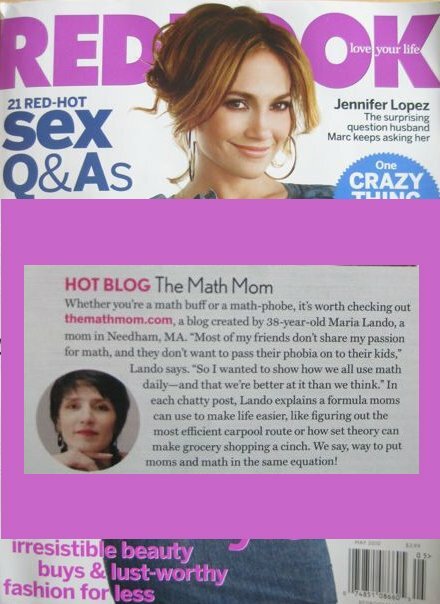 TheMathMom.com has been featured as a Hot Blog in the May 2010 issue of Redbook Magazine - now available at the newsstands. Page 158, a big picture and one small paragraph... Redbook says that it is about time we put moms and math in the same equation! Redbook question: What inspired you to start a blog about the intersection of motherhood and math? TheMathMom answer: I started writing my stories when I realized that most of my girlfriends do not share my passion for this subject, my perception of math as a reliable adviser in almost any life situation, a weapon of defense, a playful toy and a key to the future of our kids. One of my girlfriends, a Harvard graduate, encouraged me to share my stories, saying that she does not want to transfer her own math phobia to her daughters. TheMathMom's website illuminates and demystifies mathematics, showing that we all use it daily, we are much better at it than we think and we can have even more fun by applying it consciously. 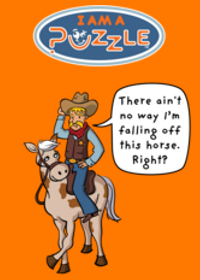 Understanding the universality and usefulness of math, we can present math to our kids as a candy through fun puzzles, encouragement, our own excitement and positive stereotyping. There are soccer moms and hockey mom, very similarly every mom can be a Math mom. Redbook question: Can you give one or two of your favorite examples of how moms can use math to make their daily lives easier? A year ago I was in a Manhattan store that advertised a 30% discount on top of 50% off. At the register I contemplated whether I should insist on the specific order of the discounts: is 30% after 50% be the same as 50% after 30%? And will these discounts together be same as 80% off? When you start figuring out the math, you realize that the order of the discounts does NOT matter. As you see these two discounts together will give you only 65% off, and not 80%. Still, 65% looks like a great deal. It is great to be prepared for all these days emotionally, financially and strategically. To know in advance what we are getting ourselves into before the school year starts. Is your work flexible enough to allow it? Can you afford hiring someone to take care of the kids for you? Finding, scheduling and paying for vacation camps and babysitters. Realistic planning can make our lives much less stressful. Check out this useful kitchen advice from TheMathMom: You put a dirty plate in, you take a clean plate out. And you repeat it all around. Good examples, its true we need to know how to do things the math way. The interview was very interesting and calculations even more interesting, moms do need to learn and apply math in real life. I mean, is a wonderful article the truth, but I also think of this blog should not too many tourists come to visit, it amazes me that no one shows any interest in such a good article. Lebron 10 Low had to urge end to end: "In short, next Monday's EGM, I will let you go with your Uncle Chen, you have to oppose this resolution. " cheap lebron 11 tried to shake off this picture, put down the chopsticks up:. "I'm full." Lebron 10 Low so with such complex feelings of a few days to attend the shareholders' meeting. For this decision to the Father, the shareholders quarreling with favor more opposition, fearing 2014 hyperdunks appeared to break kinship system within the company, bad their own vested interests. It was also still waiting to see: "hyperdunks 2014 has not agreed to the invitation, everything is still too early to say." 2014 hyperdunks has been firmly opposed to the party. This time the shareholders' meeting, but in reality is opposed to a private shareholders 2013 hyperdunks to discuss how to stop this come true. Chen Shu just the views lead to Yan Liang who asked: "? nike lebron 12, you feel it." The company's old courtiers who are watching lebron 13 shoes grew up always when she inherited the company's most orthodox candidates, a time to look to see nike kd 8 uniform. Yan Liang sandwiched between his will and his mother's will, dilemma: "kd 9 shoes ......"
The door open so that a room full of lebron 12 shoes turned and looked suspiciously.